President Armen Sarkissian hosted today the alpinist from Marseille of the Armenian origin, member of the Armenian Benevolent General Union (AGBU) Ara Khatchaturian and President of the AGBU-Armenia Vasken Yacoubian. 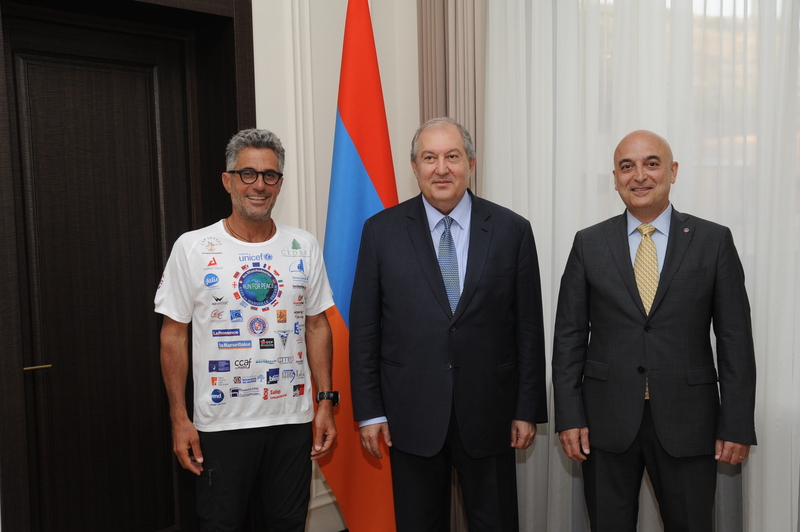 Ara Khatchatrian told about his run for peace which started last April in Marseille and finished on July 21 in Yerevan. During the marathon, he crossed 8 countries, 150 cities and towns and covered nearly 5000 km. He also presented his forthcoming programs. President Sarkissian said that he was impressed with the unique undertaking of the alpinist and wished him success.